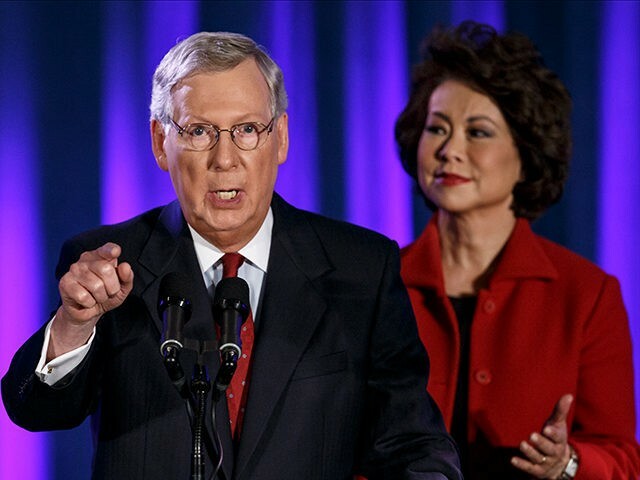 The Wall Street Journal verified the Secret Empires revelation that Elaine Chao’s sister–who is Mitch McConnell’s sister-in-law–currently sits on the board of directors of the state-owned Bank of China. “Mr. Schweizer also points to the appointment of Ms. Chao’s sister, Angela Chao, to the board of state-owned Bank of China, 10 days after the 2016 election,” reported the Journal. The Bank of China’s own website lists Angela Chao as a board member. 2. CONFIRMED: Mitch McConnell and Elaine Chao received $5 million to $25 million from her father, James Chao, whose shipping company Foremost Group does massive deals with the Chinese government. Beginning in 2007, “just as the U.S. Senate was taking up sensitive legislation concerning China,” Schweizer reports that the Chinese government’s CSSC Holdings, Ltd.—the financial arm of the Chinese government’s military contractor CSSC—named James Chao to its board. CSSC Holdings also added Elaine Chao’s sister Angela Chao to its board as well. 3. CONFIRMED: Since Elaine Chao became Transportation Secretary, her family’s company Foremost Group has ordered 10 massive cargo ships from the Communist Chinese government’s China State Shipbuilding Corporation (CSSC). 4. CONFIRMED: Since becoming U.S. Transportation Secretary, Elaine Chao and her father, James Chao, have appeared in at least a dozen Chinese media interviews, including foreign interviews that featured the Department of Transportation symbol and her father’s book. In at least a dozen interviews with Chinese and Chinese-American media outlets since her nomination, Transportation Secretary Elaine Chao has appeared beside her shipping magnate father, whose company carries goods between the United States and Asia, and who has given Chao and her husband at least $5 million in the past 10 years. In many of the videos, James Chao is introduced as founder and chairman of the Foremost Group shipping company, and, in discussing a 2016 biography about his life, speaks proudly of his daughter’s role as secretary of transportation, as she sits beaming by his side. 5. CONFIRMED: James Chao and his daughter Angela Chao sat on the board of one of the Communist Chinese government’s largest military contractors. 6. CONFIRMED: Videos uncovered by Politico reveal James Chao on camera with Secretary of Transportation Elaine Chao signaling “guanxi”—the Chinese concept of personal power due to relationships. In the Chaos’ interview with New China Press, shipping magnate James Chao says he traveled aboard Air Force One, talked “business” with President Trump, and is “very, very lucky” to have a special pin (which he wore on his jacket) signifying that he is a guest of the president. 7. CONFIRMED: Mitch McConnell and James Chao traveled to China as guests of the China State Shipbuilding Corporation (CSSC) and met with former Chinese President Jiang Zemin, a former classmate of Chao’s. Secret Empires is Peter Schweizer’s fifth consecutive New York Times bestselling investigative book.